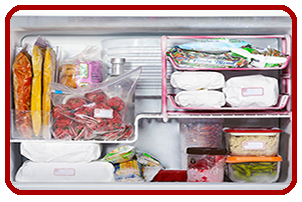 Keeping a freezer well-stocked will allow for the trapping of cold air, preventing your the compressor from overworking and keeping utility costs low. Empty the ice maker once every few months to prevent ice cubes from retaining foul odors. For odor problems, we recommend cleaning with a 1:1 mixture of vinegar and water. Remove the glass panes and shelves and then wipe down the refrigerator’s interior. Condenser coils should be cleaned periodically to keep the compressor from overworking. Be sure to use a non-abrasive material to avoid damage to the refrigerator. To prevent your compressor from overworking itself, we recommend keeping the refrigerator set at 34-38F and the freezer between 0-4F. This is also the ideal temperature to for energy conservation. Be sure to allow at least three inches of space on all sides of the unit to allow for proper ventilation. We recommend replacing your refrigerator’s water filter at least once per year. This will keep water clean and prevent clogs and leaks which could result in damage to your home. Refrigerators should be placed on a level surface. A refrigerator’s door seal will lose its suction if the refrigerator is placed on an incline. 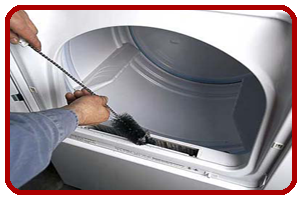 Make sure to clean the lint screen before each load to help prevent dryer fires. Check occasionally to ensure that the dryer vent is not obstructed. An obstructed dryer vent will decrease heating efficiency and can increase the risk of dryer fires. Dryer vent hoses should be cut as short as possible. To ensure maximum efficiency, there should be no kinks in the vent hose. Don’t overload the dryer — this prevents air from circulating within the dryer. For the DIY-inclined, it’s a good idea to clean out the inside of the dryer’s chassis every few years. The lint catch will prevent the majority of lint from escaping to the chassis, but there will be some accumulation over time. Vinyl dryer vent hoses should be replaced immediately as they are unable to withstand the heat of modern dryers. Grab an aluminum dryer vent hose instead. Be sure to check the pockets of clothing before placing clothing in the washing machine. 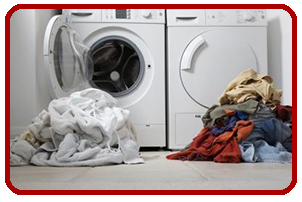 Loose change and other items can cause damage to the washing machine pump. Some articles of clothing require special attention when washing — this information can be found on clothing labels. Clothes washers should be placed on a level surface. Operating a clothes washer on a non-level surface will result in increased wear over the washer’s life. For front-loading clothes washers, leave the front door open when the appliance is not in operating. This will prevent mold growth and foul odors. For odorous washing machines, we recommend Affresh®. Avoid washing vibrant colors and darker clothing in hot water as this may cause discoloration. To prevent leakage, we recommend replacing clothes washer hoses once every five years. Certain dishes are not dishwasher safe — make sure to read dish labels. Have white film on your dishes? Due to recent EPA regulations, modern dishwasher detergents no longer resolve phosphate build-up. We recommend LemiShine to resolve these hard water deposits. To resolve hard water issues permanently, we recommend installing a water softener. 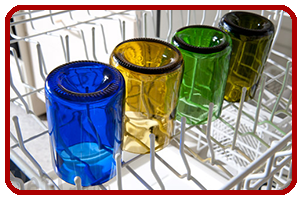 Rinse dishes before placing them into the dishwasher — but they don’t need to be spotless. Rinsing larger debris from dishes will help to prevent damage and clogging of the drain pump. Dishwashers should be installed on a level surface to prevent potential leakage. Powder detergent has a limited shelf life and will decrease in efficacy within a few weeks, so avoid buying this in bulk. Avoid using detergents with rinse aids alongside standalone rinse aids. Ensure that nothing is obstructing the motion of the spray arm before turning on the dishwasher. 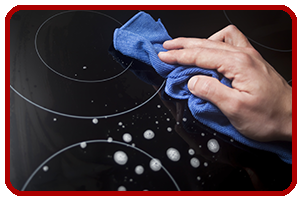 Abrasive cleaning products and steel wool can lead to scratches on a glass top stove, so we do not recommend their use. Oven light bulbs are easily replaced. Ovens typically use 40w appliance bulbs. Cast iron and stone cookware may scratch some glass top stoves depending on the strength of the glass. Be careful! Don’t store heavy items above a glass-top stove. The part cost for a glass stove top alone can be between $200 – $300. Have questions about proper appliance use? We’re here to help. Call us at (770) 809-1055 or e-mail us.